One of the favorite side dishes in our house is mashed potatoes. Any kind of mashed potatoes…classic Southern Mashed Potatoes, and especially these amazing Garlic Mashed Potatoes. The best garlic press for that we’ve found for home cooking is inexpensive and works great. It’s stainless steel and easy to use. There is nothing better than creamy garlic mashed potatoes when you’re craving comfort food. This is the perfect side dish for so many delicious recipes, whether you are a meat lover or not. Now, we all know that meat and potatoes typically go hand in hand, so if you want to stick to serving our Garlic Mashed Potatoes alongside meatloaf, meatballs (which are so easy to make with a meat-baller!) or stuffed pork loin–we completely concur. 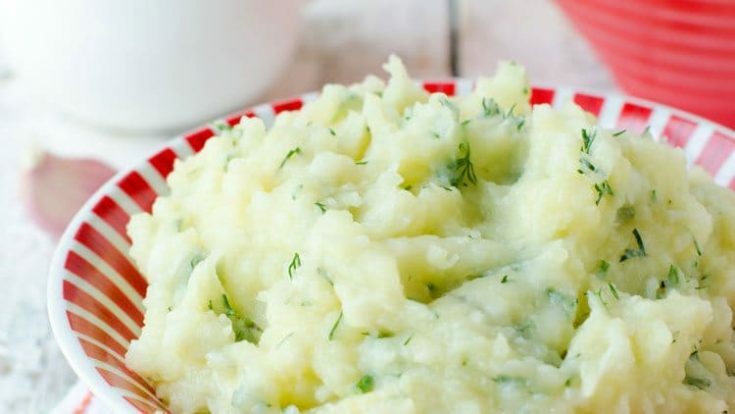 When you taste these mashed potatoes, you will fall in love with the flavor…as long as you’re a garlic lover that is. Now…these might not be first-date potatoes, unless you have some breath mints, but they are out of this world deliciousness in each and every bite. We happen to think a lot of down home comfort food around here. We’ll take it in the form of Slow Cooker Ham and Beans, Pot Roast, and even Funeral Potatoes. Comfort food is one of those things that just brings a sense of calm. It could be a bowl of chili or soup on a cold day, warm and gooey cookies with a cup of hot cocoa, or perhaps a simple sandwich loaded with your favorite toppings. It is food that makes us feel at home…food that is perfect for curling up on the couch with a good book or movie…food that in essence defines comfort, just in its very being. Weight Watchers Garlic Mashed Potatoes are an easy side dish recipe. You'll love these low fat mashed potatoes served alongside your main dish. Put potatoes and garlic in a large saucepan. Add water to cover. Bring to a boil. Cover and reduce heat. Simmer for 20 minutes or until potatoes are tender. Drain and return potatoes and garlic to pan. Using a mixer, beat at medium speed for 1 minute or until smooth. Add source cream and remaining ingredients. Beat until well blended. 4 servings, 8 Smart Points. Serve smaller serving sizes to reduce the total Smart Points. I just put this recipe into the weight watchers app and it says it’s 8 points a serving. Curious as to how you got only 3? I also swapped out sour cream and skim milk and did fat free Greek yogurt and unsweetened almond milk (zero points). Disappointed to have put this in thinking it was so low only to find it’s not! I’ll update the recipe. This was an older recipe and calculated using an older WW model. Thanks for the updated calculation!